On Monday January 22, 2018 at approximately 1:30 P.M., a residential burglary occurred on the 1800 block of Año Nuevo Drive in Diamond Bar. The victim’s residence was equipped with surveillance cameras which captured the incident. 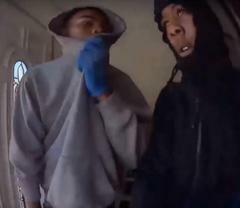 The surveillance camera footage was released to the media in hopes of gaining additional information leading to the identification and arrest of the individuals responsible for the residential burglary. 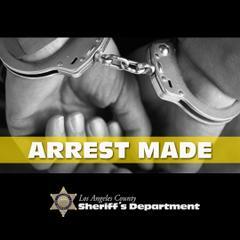 On January 27, 2017 at approximately 9:30 P.M., 19-year old Tyree Moguel, from the Los Angeles area turned himself in at the Walnut/Diamond Bar Sheriff’s Station admitting he took part in the aforementioned burglary. He was arrested and booked for residential burglary and is being held in lieu of $50,000 bail. Moguel is the suspect seen standing alone in the photo. The release of the surveillance camera footage to the media, gave the detectives the break they needed by forcing one of the individuals to come forward. Three of the suspects however remain outstanding. The suspects are described as two male blacks, approximately between the ages of 18 and 20, wearing a black, and gray hoodie sweatshirts and sweatpants. The third suspect (not seen in the footage) drives up to the residence in a white, newer model four door vehicle, possibly an “Audi” with tinted windows and paper plates. The suspects are seen running towards the white vehicle, getting in and fleeing. The Sheriff’s Department continues to ask for the public’s assistance with information on the identity of these suspects. Detectives also urge the public to remain vigilant and if they “see something say something.” Be aware of your surroundings and alert law enforcement when you see an unfamiliar/suspicious vehicle in the neighborhood. Anyone with information about this incident is encouraged to contact Walnut/Diamond Bar Station Detective Alfredo Gomez at 909-859-2832. If you prefer to remain anonymous, you may call “L.A. Crime Stoppers” at 800-222-TIPS (8477), use your smartphone by downloading the “P3 MOBILE APP” on Google play or the App Store, or use the website http://lacrimestoppers.org. On Monday, January 22, 2018 at approximately 1:30 P.M., a residential burglary occurred on the 1800 block of Ano Nuevo Drive in Diamond Bar. Walnut/Diamond Bar Station deputies responded to the residence and discovered the rear sliding glass door had been shattered by the suspects to gain entry into the residence. Investigation revealed that the victim’s residence was equipped with surveillance cameras which captured the incident. The footage (provided) clearly depicts one of the suspects knocking on the front door to determine if anyone is home. Once the suspect was satisfied no one was home, he alerted his fellow burglars and they made their way into the rear yard. 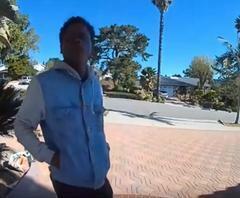 The suspects are described as three male blacks, approximately between the ages of 18 and 20, wearing black, gray and light blue hoodie sweatshirts and sweatpants. The fourth suspect (not seen in the footage) drives up to the residence in a white, newer model four door vehicle, possibly an “Audi” with tinted windows and paper plates. The suspects are seen running towards the white vehicle, getting in and fleeing. The Sheriff’s Department is asking for the public’s assistance with information on the identity of these suspects. Detectives also urge the public to remain vigilant and if they “see something say something.” Be aware of your surroundings and alert law enforcement when you see an unfamiliar/suspicious vehicle in the neighborhood.